One of the most common problems when starting a Mediterranean diet is wondering what exactly you’re supposed to buy. Cooking healthy meals is easier if you stock your cupboards with staples common to many Mediterranean dishes. This shopping list will show what your basic options are for a Mediterranean diet shopping list whilst keeping things as straightforward as possible. To make your life easier, we’ve created a standard shopping list including the key essentials. Printable version can be fount here. Frozen vegetables: Choose mixes with healthy vegetables. Spices: pepper, turmeric, cinnamon, basil etc. 1. 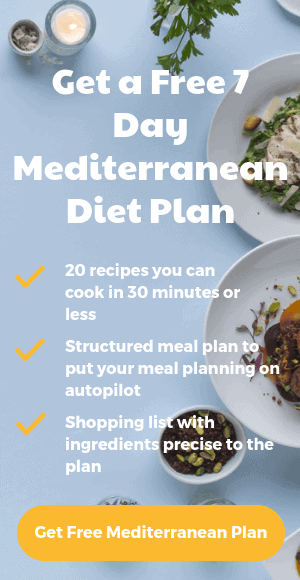 If you’d like to try the Mediterranean diet plan, get a free 7 day Mediterranean Diet plan (including 20 recipes, a corresponding meal plan and shopping list. 2. If you are serious about starting a Mediterranean diet, check out ‘Med in 28’ plan, which helps build healthy Mediterranean eating habits in 28 days. 3. If you’re looking to start cooking Mediterranean recipes—or need some inspiration—then like our Facebook page.